1. Cook the potatoes in boiling water for 10–15 minutes or until tender, then drain and return to the pan. Add the wasabi, soured cream and milk and mash well. Stir in the salad onions and season. 2. Meanwhile, press the pink peppercorns into both sides of the steak. Cook on a preheated griddle for 2–3 minutes on each side, for medium-rare. Allow to rest for 2–3 minutes. stir fry mix for 2–3 minutes. 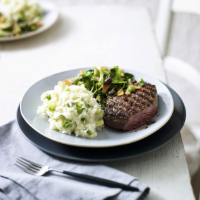 Serve with the steak and wasabi mash. If you prefer more seasonal veg, swap the stir fry mix for some steamed spinach or kale. Both are rich in vitamin A, essential for healthy skin and eyes.